At SureHarvest, sustainability is best understood and implemented as a strategic approach to how you farm or manage your food company. 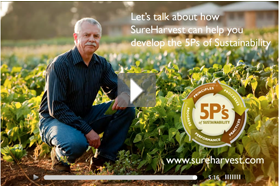 In this video, Dr. Cliff Ohmart, VP of Professional Services, walks you through the SureHarvest 5Ps of Sustainability applied to a farming operation. Motivated by questions from their buyers and pressure from regulators, the Almond Board of California is preparing their members for the future. 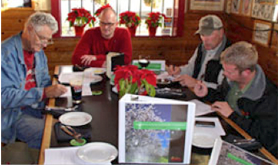 Over 100 growers have participated in a self-evaluation of their growing practices in order to benchmark current practices and identify priorities for improvement. SureHarvest is designing self-assessment modules in irrigation and nutrient management, air quality, energy and pest management. Read more in this Ag Alert report. Ravenswood- Constellation Wines U. S.
Honored as the 2010 California State Fair Vineyard of the Year, Bien Nacido is clearly one of the state's exceptional vineyards. Farming winegrapes, lemons, avocados and blueberries, the Miller family is entering its 5th generation of farming in the Santa Maria region. In 2007, the Miller family tried SureHarvest Farming MIS on 100 acres at Solomon Hills and just recently, expanded SureHarvest to manage the farming data for 1500 acres including all of Bien Nacido Vineyards. In addition, data management provides insight to improve operational efficiencies. The IT plan is to integrate SureHarvest with other systems, including SalesForce, to enable timely reports to their winegrape customers throughout the season. Most importantly, better access to vineyard data gives Bien Nacido the edge in making day-to-day management decisions that ultimately yield premium quality grapes for award winning wineries, like Qupé, Au Bon Climat, Concha y Toro and Chateau Ste. Michelle, recognized as Wine and Spirits Top 100 for 2010. TrueTrac, a food safety and produce traceability software company based in Salinas, CA, chose SureHarvest as its sustainability partner for serving the data-driven needs in the specialty crop sector. 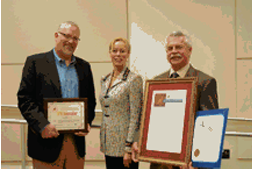 SureHarvest was honored recently as an IPM Innovator by the California Department of Pesticide Regulation (DPR) for its leadership in developing and implementing the California Sustainable Winegrowing Program and supporting sustainability information management technologies. "Our work at SureHarvest, and that of my fellow honorees, is a manifestation of the groundbreaking contributions of Hagen, van de Bosch, Huffaker and Stern who built the scientific foundations of IPM at UC Berkeley and UC Riverside,” stated Dr. Cliff Ohmart, VP of Professional Services for SureHarvest. Read press release. Dr. Jeff Dlott, DPR Director Mary-Ann Warmerdam and Dr. Cliff Ohmart. Given the growing relevancy of sustainability in the agricultural industry, the American Vegetable Grower magazine launched a column entitled "Sustainable Ag” with SureHarvest CEO Jeff Dlott writing as a guest columnist. In his debut column, Jeff articulated the benefits of integrating sustainability as a business strategy to drive day-to-day operations. Noting that, "It would be impossible to find a successful manufacturing company that does not have "measure to manage” baked into their corporate DNA,” Jeff suggests that agriculture too, would benefit from similar performance management approaches. Read Jeff's column and watch for more to come. Unable to see this email? Please click here to view it online.